Are you up for a bathroom remodel in 2019? Then take a look at these gorgeous bathroom design trends that are both functional and jaw-dropping. If you have been mulling over retiring your translucent shower door and enclosure, then you might want to take a look at the extraordinarily wonderful range of modern shower stalls available these days. The in-the-moment shower stalls are those that sport stunning color grids, dramatic patterns, and head-turning designs. This refreshing bathroom design trend is flexible and easily adopted on your choice of bath linens and tiles. You can also showcase retro neon color palettes on shower curtains. This promising trend on bathrooms is great if you simply want to enliven your space but do not want to fully commit to an all-out renovation. The rough industrial look is going particularly strong in 2019. Expect modern bathroom designs to feature double-trough basins, brushed stainless steel taps, and exposed water pipes. One great bathroom décor trend to consider is an accent wall consisting of snazzy waterproofed wallpaper or tiled arrangements. Keep in mind that bright colors are having their moment. The same is true for oversized floral patterns. An alternative to a statement wall is a spectacular art piece suspended on the wall of your powder room. A one-of-a-kind vintage mirror also lends the same effect as a statement wall. If you’re up for redoing your bathroom floor instead of a wall, however, then work at a statement floor. A floor with a graphic tile arrangement would do while keeping the rest of the bathroom neutral. 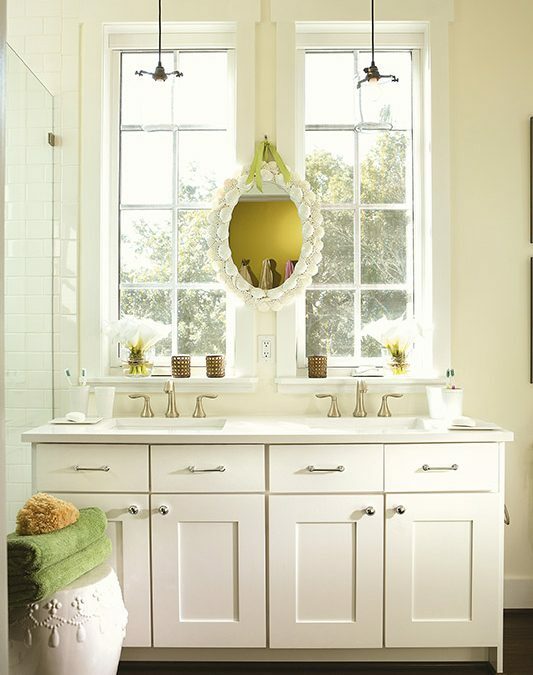 If your bathroom or powder room has a window, consider installing your vanity in front of it. You can wash up in the sink and look out the window. Have a mirror nearby, too, because this burgeoning design trend leverages natural lighting for when you are touching up your makeup or shaving. A bathroom is an otherwise utilitarian space, unless you do something about it. A tweak here and there, and you just might give it a spa-like ambiance where you can relax after a grueling day.